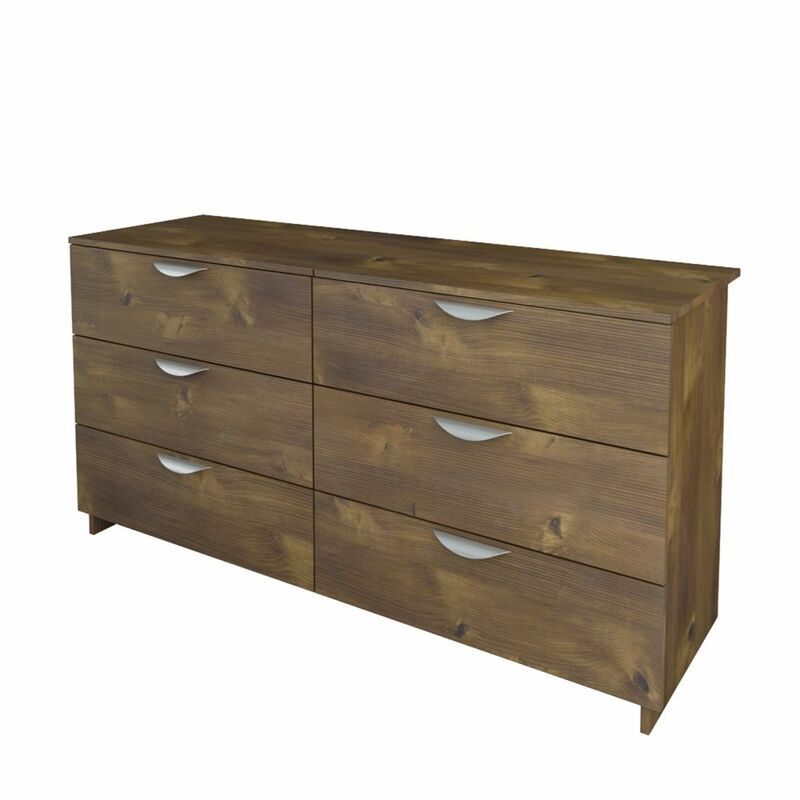 This contemporary dresser from Nexera provides a truly timeless look, blending easily into any style of decor. It's constructed with a sturdy manufactured wood exterior and stunning brown finish. Modern with timeless Mid-Century flair, the Hamilton tall dresser is a classic, artfully crafted, and transitional piece that will blend well with any existing decor. With six drawers instantly allowing for ample storage space, this dresser is sophisticated without overtaking a space. Splayed wood legs add to a touch of design interest making this the ideal addition for any home. Complete the dining room or bedroom in a perfect blend of Mid-Century design and modern functionality, with the Liberty sideboard or dresser, that is as versatile as it is crafted to perfection.Featuring four full-extension drawers, one open cubed space, and three unique and convenient compartments, the piece is perfect for storing dishes or clothing, and other favorite items. Metal handles amp up the design, making this piece one that steals the attention without overtaking a space. Dixon 6-Drawer Double Dresser from Nexera features 6 drawers on metal slides when to store clothes and personal effects. Dixon Collection is the perfect bedroom suite for your little gentleman. It is offered in a rich textured lacquer and laminate finish with metal handles and generous storage space for all his toys, clothes, comic books and more! Nocce 60-inch x 30.75-inch x 19-inch 6-Drawer Dresser in Brown This contemporary dresser from Nexera provides a truly timeless look, blending easily into any style of decor. It's constructed with a sturdy manufactured wood exterior and stunning brown finish. Nocce 60-inch x 30.75-inch x 19-inch 6-Drawer Dresser in Brown is rated 2.0 out of 5 by 1.